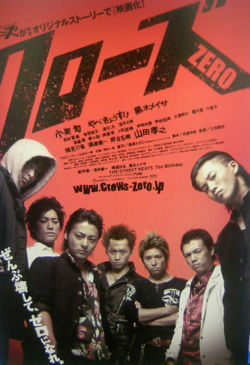 Suzuran High School is also known as The School of Crows. The biggest clique, Serizawa Army and its boss Tamaran Serizawa are challenged by a new student to the school, Kenji Takiya. Takiya, son of a yakuza boss, wants to be the schoolâ€™s ace fighter. But at the advice of Ken Katagiri, a low-ranked start-out yakuza, Takiya starts to muster together a gang of his own. And as he grows into a true leader, he must face an ultimate battle with Serizawaâ€™s gang. Through Serizawa and Takiyaâ€™s battle, director Takahashi shows not only his unique aesthetics for violence but also the true meaning of charisma, friendship, and leadership.